Books on ancient warfare often reproduce certain pieces of Greek art from the middle of the fifth century BCE, including a rhyton shaped like a screaming Persian, a series of vase paintings with Greeks striking down cowering barbarians, and another where a man naked except for a cloak and unarmed except for an erection charges at another wearing Scythian dress with the caption “I am Eurymedon / I stand bent over” (the Athenians and their allies won a famous victory over the Persians at the Eurymedon River in southern Anatolia, although spoilsports sometimes point out that Eurymedon seems to be the pursuer instead of the pursued). In the Hermitage in St. Petersburg, there is another Greek depiction of a foreigner which is usually left out, no doubt because the authors are not sure how to obtain the rights to reproduce it. The face of the signet ring of Athenades. In the State Hermitage Museum, St. Petersburg, Inv. No. Π.1854.26. Photo from Yuri Kalashnik, Greek Gold in the Hermitage Collection: Antique Jewellery from the Northern Black Sea Coast. (The State Hermitage Publishers: St. Petersburg, 2014) pp. 76, 77. The ring has the inscription ΑΘΗΝΑΔΗΣ on its face. The Hermitage interprets the name Athenades as the goldsmith who made it, but I think that it is more likely the original owner of the seal. Cheap work like red-figure pottery might increase in value because it was made by a respected master, or the painter might take some liberties on the understanding that his anonymous customer in distant Etruria would be unable to object, but the design of a large gold seal was serious business, and the metal was worth far more than the time used to make it. * If the artist had insisted on signing his work, he could have put a small signature on the band or the inside of the ring where it would not show every time the seal was used. Side view of the signet ring of Athenades. In the State Hermitage Museum, St. Petersburg, Inv. No. Π.1854.26. Photo from Yuri Kalashnik, Greek Gold in the Hermitage Collection: Antique Jewellery from the Northern Black Sea Coast. (The State Hermitage Publishers: St. Petersburg, 2014) pp. 76, 77. 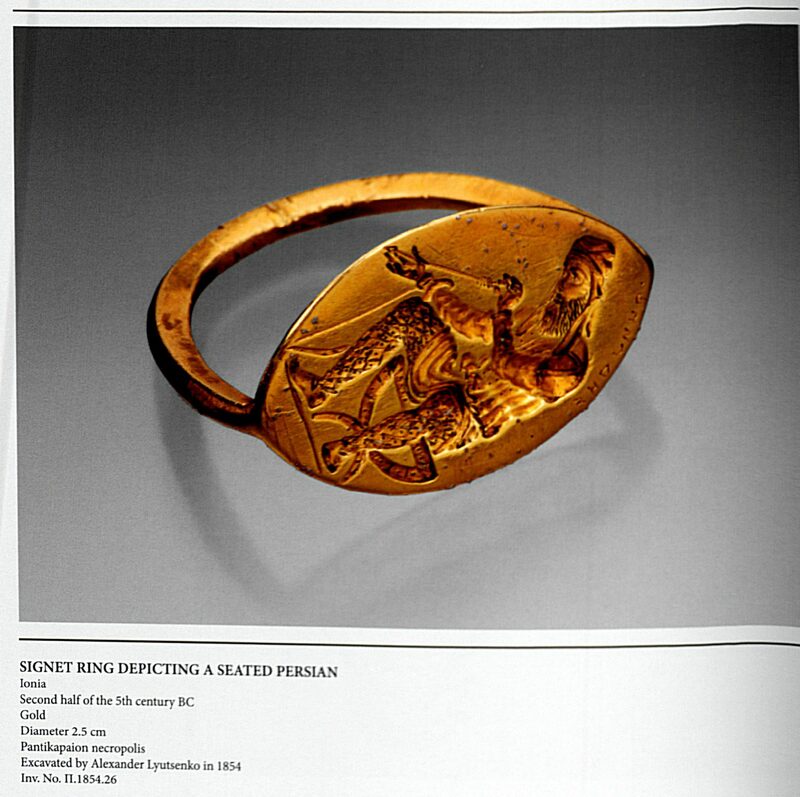 The ring was excavated by Alexander Lyutsenko from Pantikapaion Nekropolis in the Crimea. The style suggests that it was made in one of the Greek cities in western Anatolia in the second half of the fifth century BCE. The silvery dots in the face of the ring are nuggets of iridium, osmium, and ruthenium. Small amounts of these “platinum group” metals were found now and then before the 19th century; there are stories of conquistadors finding them amongst the treasures of the Aztecs and Incas and discarding them. The goldsmith poured them into his mould to create a pattern like stars. 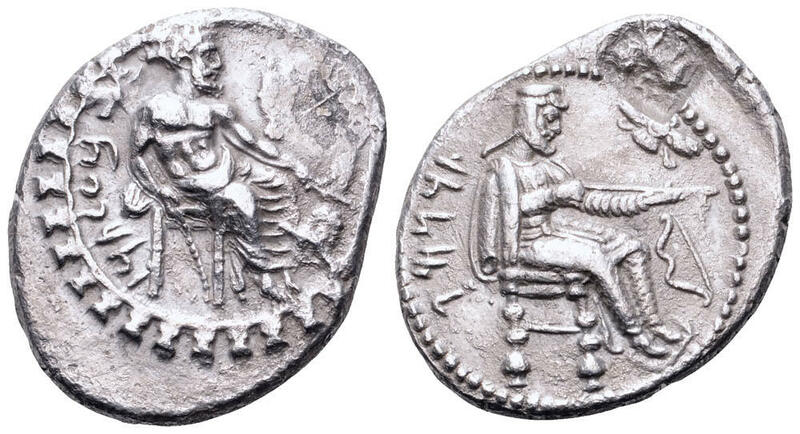 A silver stater of Tarkumuwa (= Greek Datames?) sold by Roma Numismatics Ltd E-Sale 27 Lot 255; cp. the example in the British Museum in Curtis and Tallis eds., Forgotten Empire, p. 205. Photo presumably belongs to Roma Numismatics Limited. The motif of a man on a folding chair inspecting an arrow is better known from a series of coins from the fourth century BCE minted in the Levant. Some scholars identify him with a noble, Datames, who is famous in Greek literature and in the right place at the right time, but the Aramaic spelling of the name on the coins is hard to reconcile with the Greek version. It is wise to check arrows now and then to make sure that they are still straight, that the feathers are not damaged, and that the head is still firmly attached, but presumably the message is something like ‘I am a skilful and thoughtful warrior.’ Darius’ grave inscription stressed his ability to remain cool and collected and avoid hasty decisions, where the Assyrian kings emphasized their flaming wrath and the righteous violence which they inflicted on evildoers. If my gentle readers know of any other examples of this motif, I hope they can suggest them in the comments! Some scholars interpret the baggy pleats on Tarkumuwa’s sleeves as the armguards of metal bands described by Xenophon, depicted in Hellenistic reliefs from Pergamon, and preserved in Roman archaeological sites. However, similar styles of clothing are common in Iranian art in later periods and usually understood as cloth. 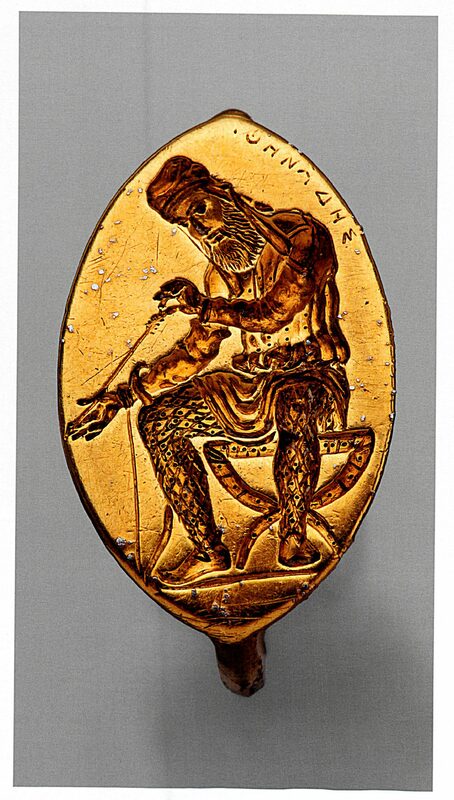 The man on the golden signet ring has the same pattern of rhombuses and dots on his trousers as on the armour of Patroklus in the vase painting which I posted last fall. While I am not sure that both artists are trying to show the same thing, this does remind us that its important to look widely before guessing how an object depicted in art was made! The Hermitage does not make photos of most of their archaeological collection available, even to foreigners who would happily pay tourist prices for them. But I am glad that they shared the seal of Athenades. Further Reading: A wider book on the adoption of foreign goods and customs in a different part of the Greek world is Margaret C. Miller, Athens and Persians in the Fifth Century BC: A Study in Cultural Receptivity (Cambridge: Cambridge University Press, 1997) ISBN 0-521-49598-9.